Got an Old House that needs New Granite Counters? Do you want to be without water for days? What you say? That’s crazy talk! Here is how it works: for your new granite counters to be installed, the old countertops have to come out. Whether we take them out, or someone else takes them out, the water will need to be shut off to the sink that is installed on the old counters. If your shut-off valves work, then this is easy. If the shut-off valves leak, then this isn’t so easy. You need to get new ones put on before the counters can come out. The shut-off valves are the little silvery oval things you can see in the photo – one to the right and one to the left of the drain. To turn off the water, turn them to the right. Sing this: “righty tighty, left loosy” as you turn them to make sure you’re doing it right. Then, turn on the faucet and see if the water still turns on. If so, you need to do some plumbing work before we can install your new granite counters. Replacing your shut-off valves might be easy, or it might not be. If you’ve done a lot of plumbing, then you know that no matter how many of these you have replaced, this one might be the one that stumps you. Most don’t have good photos. Some don’t remind you to shut off the water to your house, first! Most don’t tell you that you need to identify the type of fitting you have before you go shopping for new valves. There is a big difference between replacing (or installing) shut-off valves in an old house, and replacing the ones in a not-so-old house (but still not new since most new house have shut-off valves that work just fine). 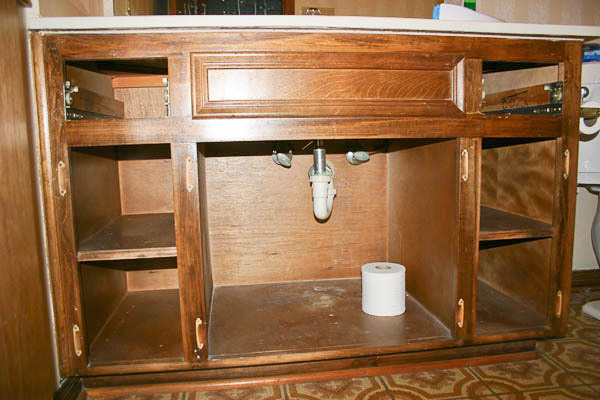 One article that was better than the rest is on This Old House’s website: Adding Sink Shut-Off Valves. Beware – some neglect you to first shut off the water to your house!! Make sure you do that first, or water will be spraying all over! Oh, and make sure to start this in the morning, so the big box home remodeling stores are open. You might be making a few trips so you really don’t want to start late at night. Oh, and puh-lease do this several days or a week before we arrive to install your new granite counters or you will be disappointed and our guys will be extra tired from having to put your beautiful new counters back on the truck to bring them back to the shop to wait for a later installation date. That was snagged from a post I (Alison) wrote several years back called You Can Do It Yes You Can about updating a bathroom in my 1980s home in NW Austin. 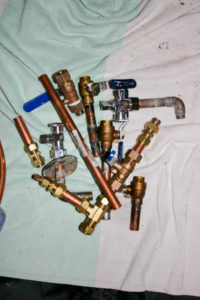 Those are shut-off valves – the ones that I wnet through trying to DIY before calling a plumber.